The youth hostel in Bellever Forest lies right in the middle of the Dartmoor National Park. Since 2012 it's been called YHA Dartmoor and is the main hostel in the area. The hostel is one of the earliest ones that is still in use. It opened in 1934 but was originally a barn that was part of the Duke of Cornwall's Model Farm, which was owned by the Prince of Wales. Bellever forest consists mainly of conifers surrounded by the wild, open moorland dotted with granite tors and prehistoric dwellings and monuments. However the small village of Postbridge is not too far away, with a shop and the famous clapper bridge. On arriving at the hostel, one thing that stood out was how cosy it felt, compared to some hostels that I have visited in the past. The building has thick stone walls against the Dartmoor weather, which can sometimes be very fierce. The common room had a great granite fireplace and comfy chairs. The other things that I immediately noticed were some of the other items of furniture that were in the hostel. The pieces had obviously been made using one-off or small batch production methods using slabs of English elm and, in the case of the two armchairs in the common room, handmade iron nails with the heads left faceted. Elm is a traditional wood used in furniture making, as boards of elm are less prone to splitting than many other kinds of timber. Unfortunately, since the late 1960's large elms in Britain are very rare thanks to the arrival of Dutch Elm Disease. It would seem likely that this furniture dates to at least the 1970's, although I suspect that it could be older judging by the quote at the start of this post. There were more benches in the games room in another part of the hostel. I love the way that the pegs holding the bench together are extended into legs in the design above and the large armrests on the design below. I also noticed tables made in a similar way from even larger pieces of elm in the pub in Postbridge. Perhaps they all came from the workshop of the same local maker? Sadly, there is no information that I can find about where the furniture came from. Garry Hayman, longtime manager of the hostel who now works at YHA Swanage, mentioned seeing an old postcard of the common room that looked hand drawn. He thought that the two settles shown above could be seen on it and also said that it was entirely possible that the furniture was brought into the hostel when it opened in the thirties. So the origin of the elm furniture will probably remain a mystery. The designs were all simple, practical but also comfortable and seemed to fit the place and its rugged moorland location perfectly. 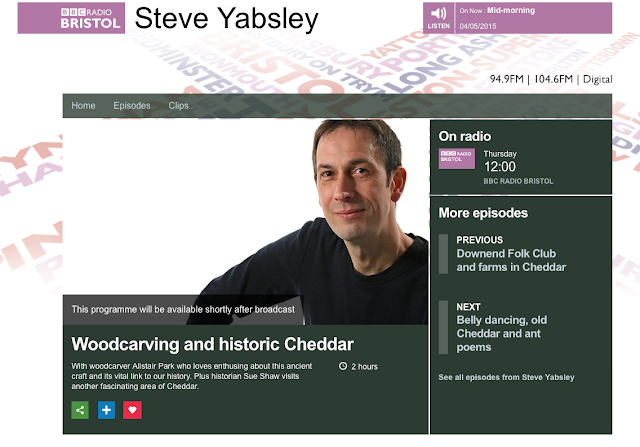 Today I packed a large rucksack full of tools and carvings and headed over to BBC Bristol on Whiteladies Road in Bristol. Steve Yabsley - or 'Yabbo' - was going to interview me on his lunchtime show. 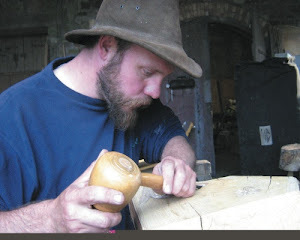 Steve had phoned up out of the blue last week and asked if I'd like to chat about woodcarving with him. Of course I was happy to! So I arrived at the studio feeling nervous and excited. Simon the producer met me at reception. He was welcoming and friendly and helped calm the nerves a lot. 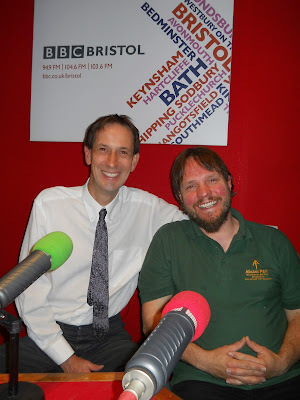 Steve was also relaxed and friendly, even though he was dealing with a few technical difficulties at the time. So.... I had carved a kiltpin that I thought was very beautiful. It didn't quite work with the kilt outfit! The golden yellow colours of the kiltpin clashed with the colours of the kilt more than expected and the pin felt slightly too heavy hanging on the cloth. The round shape also felt a little odd and I realised that a longer, narrower shape was more suitable. The carving would make a stunning brooch, especially for a plaid, however it was not going to be my kiltpin. It was time to carve another one. I decided to use the laburnum wood that was used in making the handle and sheath of the sgian dubh again, so that the two pieces would be linked and would look good worn together. What to carve on it? One design that stood out was originally from the Book of Kells. It was reproduced in Courtney Davis' book 'Celtic and Old Norse Designs', published by Dover Publications. The design could be easily adapted to work on the kiltpin. Although it looks a lot like a classic celtic knotwork pattern, in fact it isn't a single knot. If you look carefully, the two dragons run through an infinity symbol. The kiltpin is 6cm (2⅜") long from top to bottom. It was entirely carved using my trusty old number 10 Opinel lock knife, with which I originally taught myself whittling over twenty years ago, and was then lightly sanded with some sandpaper to finish it off. The only parts that weren't produced with the knife are the tiny drilled holes into which silver wire or hand-carved dowels of reclaimed ebony and found plum timber were inserted to make the eyes, nostrils and neck patterns. The laburnum was first shaped whilst sitting on the Centenary bench that I made a few years ago and which is now installed in Leigh Woods. The kiltpin was polished using beeswax polish at the end, which really brought out the grain patterns and colours. It has a bought brooch pin glued to it and then fixed on with brass rivets (made by cutting down two brass pins). The carved recess means that the pin doesn't hang too far off the surface of the cloth and roll from side to side.